Hi all! It's Kady from Teacher Trap! 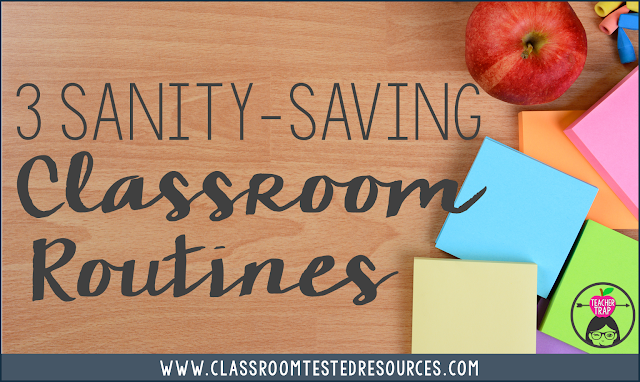 With the start of a new school year, I very quickly remembered my 3 favorite classroom routines and I want to share them with you today! 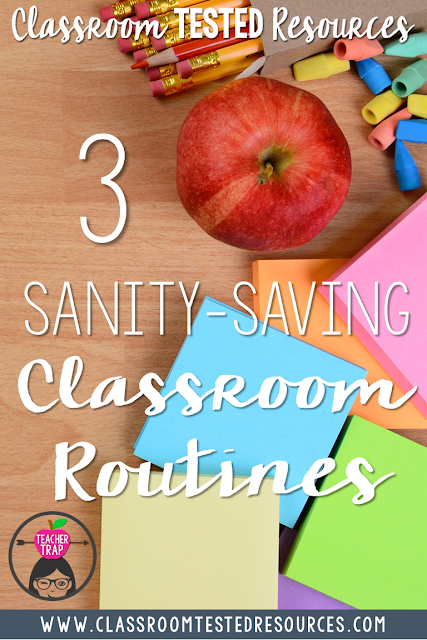 These routines have truly saved my sanity and made classroom management SO MUCH EASIER! This idea came to me after many frustrations with students not having supplies ready for the day. I can't stand hearing the pencil sharpener running during the school day, or hearing students complain that they don't have a glue stick while we're in the middle of a lesson. The routine is simple. As part of their morning jobs, students are supposed to prepare their supplies for the day. Then, when announcements end, we do a quick "Supply Check." (At our school we use "Dollars" as classroom incentives and students can use the Dollars to purchase rewards and privileges at a school store. You could replace the Dollars with any little reward though!) For the "Supply Check" I call out 3 different supplies from their box and students hold them up. If they have all 3, students earn a Dollar. For example, I might say, "Hold up your two sharpened pencils, a yellow marker, and your scissors." Dollars all around! This routine is quick and easy, and for me, has amazing results! No more interruptions due to missing supplies. Plus, students have to take responsibility for being prepared for the day. The only time students may talk to me about missing supplies is BEFORE morning announcements when they are checking their box. You know your own body. You know when you need to go. Take care of yourself but don't miss learning. As a class, we discuss and chart "Good Times to Go" and "Not Good Times to Go." Students are welcome to use the restroom or get water during any independent work times, during classroom breaks (like GoNoodle time! ), or during partner or group activities if they go quickly. We discuss the importance of being in the room during carpet meetings, lessons, and directions. At my school, we have a bathroom in the classroom, so I train students to watch for times when the bathroom is empty rather than waiting near the door. Before, when my students used the hallway bathroom, I used a little sign-out on a whiteboard where students wrote their name when they left and crossed it off when they returned. I've done this procedure successfully with both first and third-graders. I always explain that I am trusting students to make good choices. If I see students abusing this system or choosing poor times, they can lose the privilege of going whenever and will have to raise their hands and ask for permission. Amazingly, this has NEVER happened. The kids seem to want this freedom so they make sure they don't lose it. This one changed my room big time!! In fact, I wrote an entire blog post about this routine! During the first few days of school this year, I immediately remembered why I love this routine so much! After every activity, it was like a whack-a-mole of "I'm Done's." "I'm done. What do I do now?" Students were rushing through every activity to be the first to finish, or to find out what was next. I was getting messy, half-finished work all over the place. So on the third day of school, I introduced this routine. I explained that sometimes there is no "I'm done." That during many activities, I would expect students to use the entire time to improve or add to their work. Writing Workshop is a great time to teach this because during independent writing time, I expect students to keep writing until the time is up. We made a list of ways to improve or add on to work including rereading, adding details, and checking for mistakes. I have cards on magnets that list the options for what students will do after finishing independent work. They include: "Read Quietly" "Begin Next Assignment" and "No "I'm Done." I use the "No "I'm Done" card more than any other because I want students to get in the habit of using all their work time and doing their best. The kids quickly learn that there is no reward for being the first done or rushing through their work. These simple routines have made such a difference in my classroom! If you're struggling with the same issues I was, try it out! 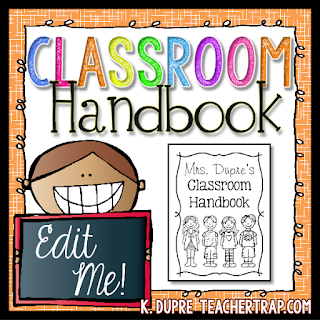 And if you're looking for more ideas for routines and procedures, you might like my Editable Classroom Handbook. I'd love to hear what other classroom routines have made your life easier! Thanks for reading!